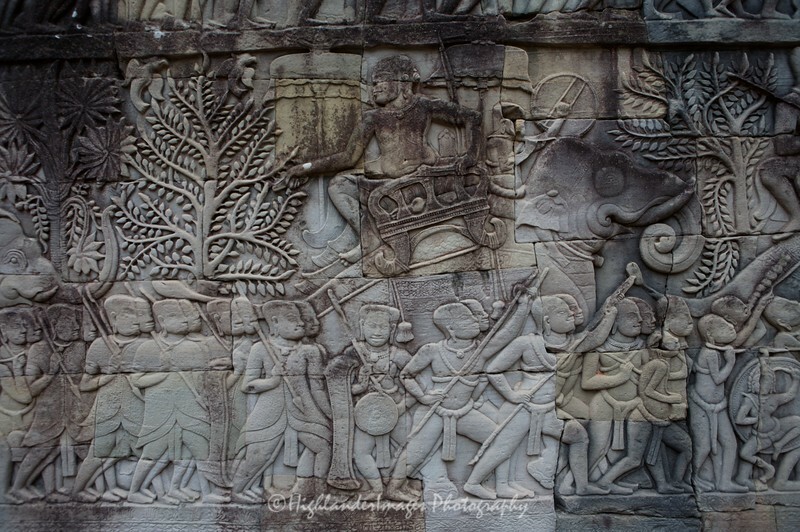 The Bayon is a well-known and richly decorated Khmer temple at Angkor. Built in the late 12th century or early 13th century as the official state temple of the Mahayana Buddhist King Jayavarman VII, the Bayon stands at the centre of Jayavarman's capital, Angkor Thom. Following Jayavarman's death, it was modified and augmented by later Hindu and Theravada Buddhist kings in accordance with their own religious preferences. The Bayon's most distinctive feature is the multitude of serene and massive stone faces on the many towers which jut out from the upper terrace and cluster around its central peak.